Comment: Quality checked pre-owned articles. Media article in excellent condition. 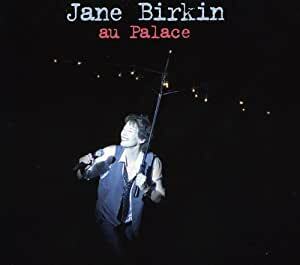 Stream Au Palace by Jane Birkin and tens of millions of other songs on all your devices with Amazon Music Unlimited. Exclusive discount for Prime members. I've been going through a Serge Gainsbourg and Jane Birkin reappreciation period this year. First there was the excellent French bio-pic "Gainsbourg: Vie Heoric", and then came the news that Jane Birkin would be touring the US. I couldn't hardly believe it, so I looked whether she had made a new album recently, and in fact her most recent studio album is "Enfants d'Hiver" from 2008, which Birkin then went out on tour in support. This live album comes from that tour. "Au Palace" (2009 release; 21 tracks; 76 min.) understandibly features a number of songs from "Enfants d'Hiver", in fact 7 of them are on here, representing one-third of this album's tracks. While these songs are not bad per se (in fact I really liked "Pourqoui" and "Prends Cette Main"), overall they do no live up to the quality of the 14 other tracks on here, which of course are all Gainsbourg-penned songs. These 14 songs are a synopsis of Jane Birkin's best solo output, including such staples as "Ex-Fan des Sixties", "Ford Mustang", "Yesterday Yes A Day", "Fuire Le Bonheur", "Je Suis Venu Te Dire Que Je M'en Vais", and so on. What impressed me most about this live album is how strong Birkin's voice sounded, as if the paper-thin voice form yesteryear was all just a facade. Jane Birkin has released several other live albums but this one is the only one from her latter day career. As mentioned earlier, Jane Birkin recently toured the US, and I had the good fortune of seeing her at the 9:30 Club in Washington, DC just last week, and what a performance she and her 4 piece back-up band put on. They played for 2 hours, bringing many of the Gainsbourg-written songs you'll find on this "Au Palace", and Jane brought them with grace and humor, sharing tons of stories about life with Serge and how these songs came about. And at this show I was also impressed how strong her voice was. In all, an unforgettable evening!